Here are some examples of the many different types of memorials available today; listed in general categories. 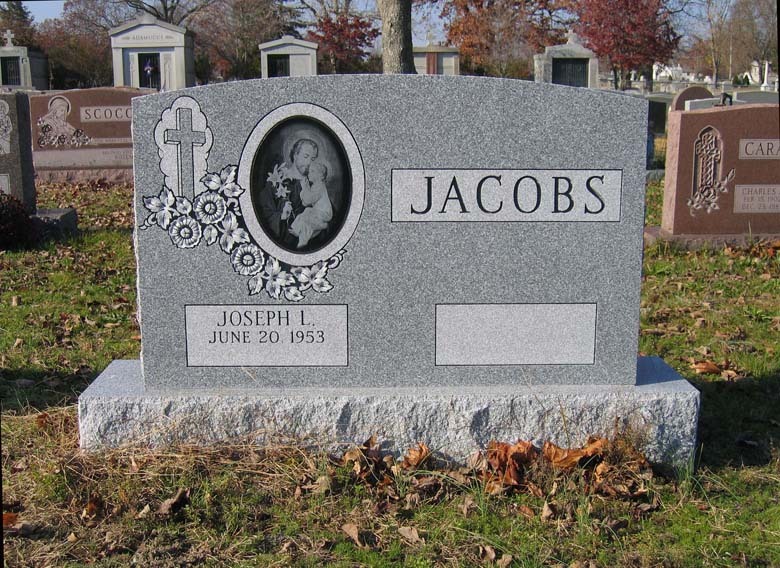 They are offered in a wide array of granite colors, guaranteed to stand the test of time. Note that any of these types may be altered to any specifications limited only by our collective imaginations. Select from hundreds of stock designs, or have a unique design created just for you. 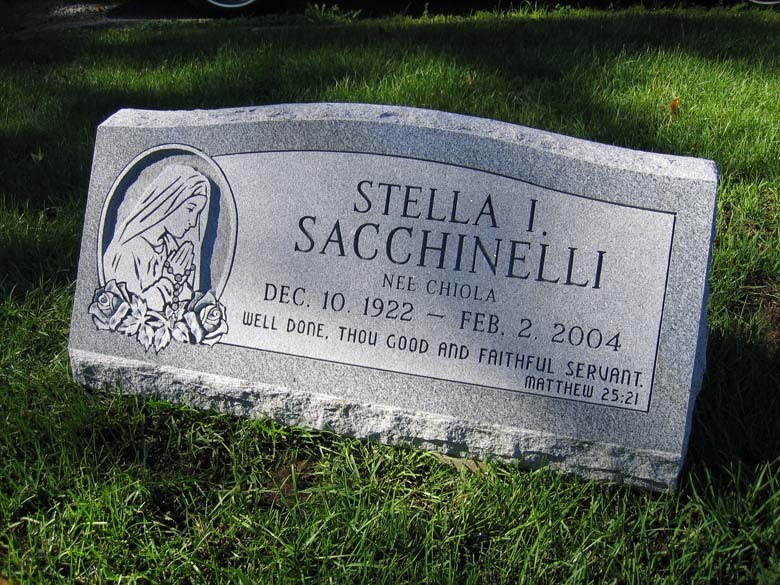 DESCRIPTION: Generally used to commemorate an individual. Longer versions can accommodate two or more. Various sizes are available, but are all usually 4 inches thick. It sits flat on the ground or flush with the ground. DESCRIPTION: Usually selected for an individual. Various sizes are available. It is slightly higher in the back than the front, thus creating the beveled face. This is more visible than the flat marker. DESCRIPTION: Usually chosen for an individual interment. They are available in assorted sizes. They are very low in the front and higher in the back than the bevel marker, thus creating the slanted face. 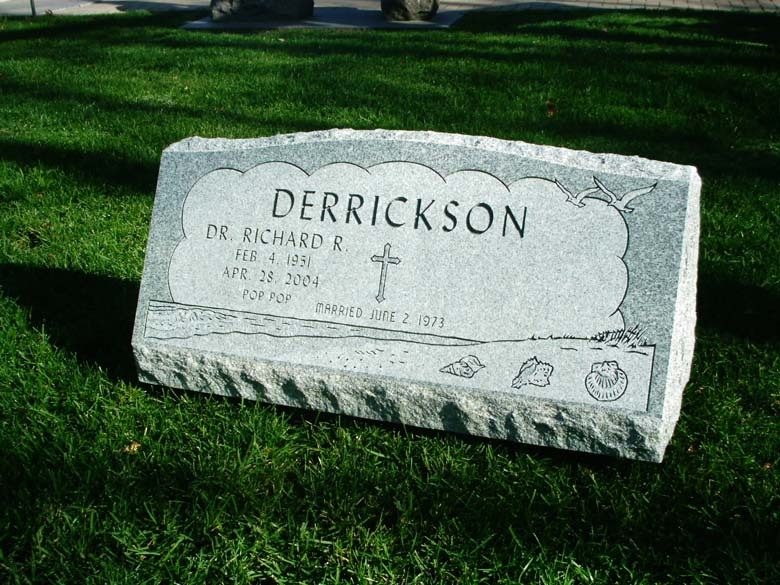 DESCRIPTION: Generally selected for a companion (2 interment) situation. They are available in assorted sizes, and as with the single version  low in the front and high in the back creating the slanted face. DESCRIPTION: A two-piece unit where the top tablet is higher than it is wide. They are available in many shapes and sizes. The smaller sizes generally are used for individuals, while the larger versions can accommodate two or more inscriptions. DESCRIPTION: A two-piece unit where the top tablet is wider than it is high. They are available in many shapes and sizes. 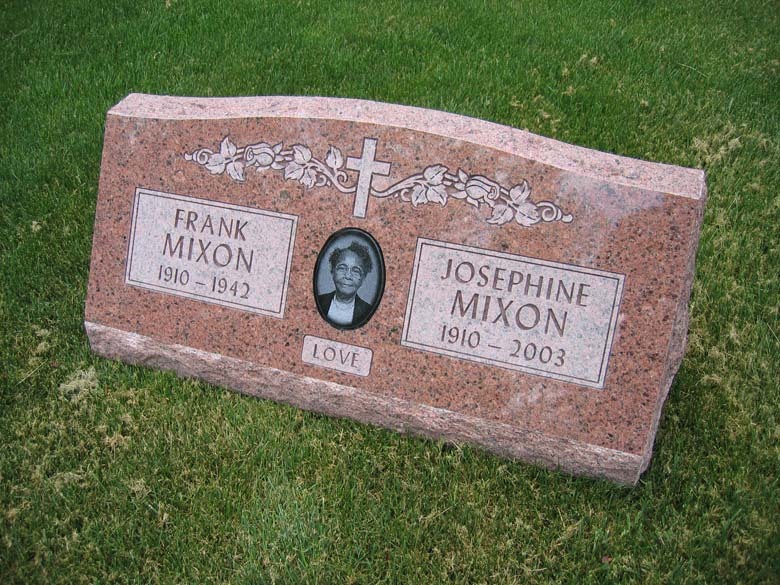 While smaller versions can be used for individuals, this is generally selected as a companion or family memorial for 2 to 6 inscriptions. DESCRIPTION: Cast bronze plaques are available in assorted sizes. Smaller sizes are for individuals, while longer versions are used for companion situations. 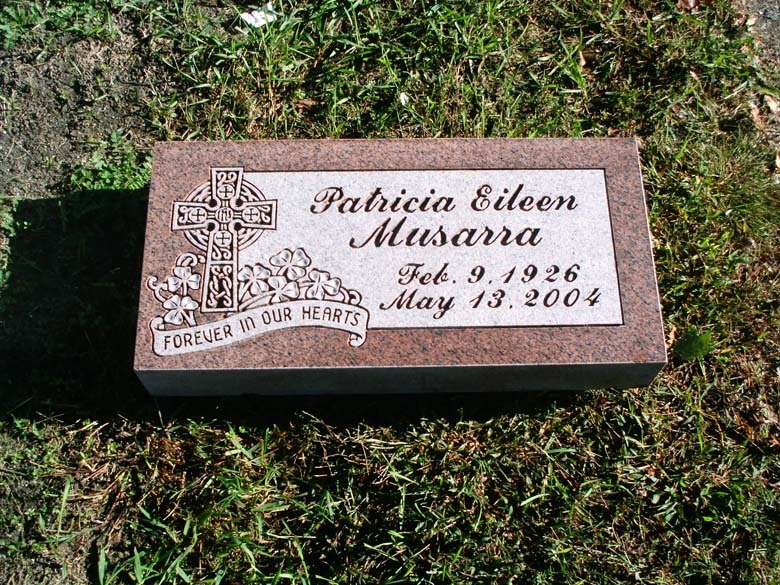 Usually these are set flush with the ground on a cement or granite base, however they can be mounted on other types of memorials. These plaques are also available for commercial applications, public memorials, dedication plaques, etc. DESCRIPTION: For centurys private mausoleums for above ground entombment have been regarded as among the finest and most dignified forms of burial. Many models are available from one to eight or more, in a wide variety of styles and colors. DESCRIPTION: Designs only limited by our imagination. While they can be just an artistic piece, they generally are designed to tell the story about a special individual or event. Creative use of medium, finishes, textures and color are the hallmarks of this type of memorial art. DESCRIPTION: Old world craftsmanship is utilized to either carve a variety of themes into the stone itself or to create artwork that will be cast in bronze or other materials. These can either be part of the memorial or attached to the memorial. DESCRIPTION: Community, civic and religious organizations commemorate people, places, things and events. War memorials honor those who have served and made the supreme sacrifice for our country by giving them the permanent recognition they deserve. We usually work with groups to develop an idea into a design that can be carried out from start to finish, within their budget. (See additional photos in gallery). 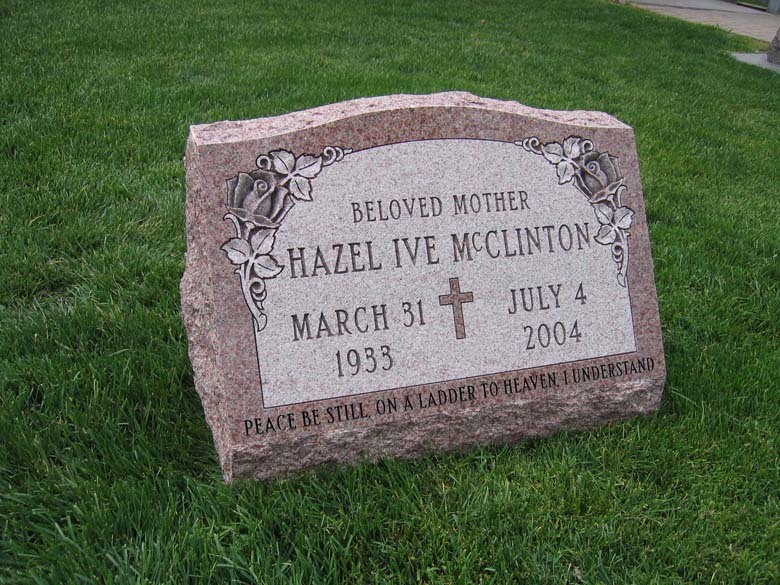 These are just some of the most recognized types of memorials. While it does not cover all of the different categories, they are the ones most commonly used in this area at this time.